SHOVEL Knight: Specter of Torment harks back to the glory days of hard-as-nails 8-Bit gaming. The series is a homage to the unforgiving platformers of that era, clearly influenced by Ghosts n Goblins and Castlevania. 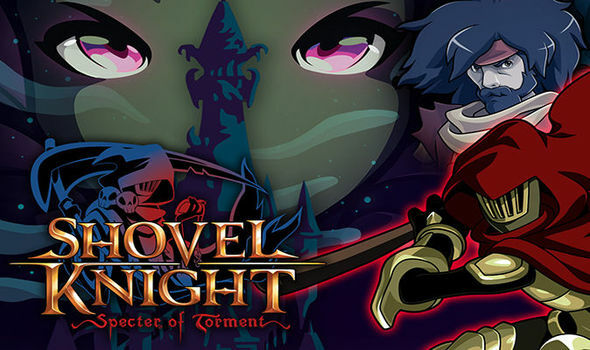 The latter Konami classic is what Specter of Torment, a prequel to the first Shovel Knight, pays service to most. In the Nintendo Switch launch title, you step into the shoes of Specter Knight – a boss from the first game. He’s on a mission to recruit a powerful order of knights for the villain Enchantress – but he’ll have to defeat each one to sway them to the dark side. Like other games in the Shovel Knight series, you’ll have to tackle a series of castles filled with enemies and fiendish obstacles. While Shovel Knight was able to use his shovel to jump on top of enemies and bounce off them, Specter Knight has a much more flamboyant weapon. He wields a scythe which allows him to perform a quick jump diagonally upwards or downwards. All Specter Knight needs to do is time his attack perfectly on an airborne enemy or on certain obstacles. It’s a very stylish ability and is extremely satisfying when you can chain multiple of these attacks to quickly travel through the air without touching the ground. As with previous games in the series, the level design is superb and often you need pinpoint platforming skills to get through it. Sometimes the difficulty level may seem unforgiving, with the placement of enemies or obstacles appearing unfair. But like with Dark Souls, another hard-as-nails game, repeated attempts will ensure you find a strategy to succeed.